Would you like to decorate your home with Jamie Fraser? Aye, you would. 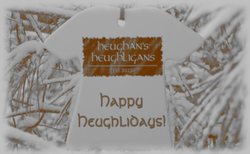 Dinna fash, Jamie and Claire Christmas ornaments can be found right here. There's a fair few of us who would love to find Jamie Fraser under our Christmas trees on any given festive morning! However, Claire doesn't appear to want to share, so we'll have to make do with a few tokens on the tree instead. 'Outlander' Christmas ornaments are here, all waiting to add to your festive cheer. I've collected together a fine selection for Diana Gabaldon fans everywhere. Because nothing decorates a home quite like the Laird of Broch Turach! Fans of Diana Gabaldon's books and the Starz televsion adaptation of 'Outlander' will find seasonal cheer right here. At the time of writing, I'm once again reading Diana Gabaldon's epic Outlander series. I've reached as far as Drums of Autumn and that first winter up on Fraser's Ridge. Of course I know what will happen next. This isn't my first time through the story. But for now I can immerse myself in imagining a feather bed inside a half-built cabin, the snow softly falling on the buckskin covers of the windows. It's the closest that I'll actually get to spending Christmas with Jamie and Claire (plus Ian and Rollo, at this stage in the proceedings!). But imagination is such a powerful thing. My mind takes me there, aided and abetted by Jamie and Claire Christmas decorations dangling from my tree. It's almost a wind-swept pine, laced with ice on a wilderness mountain. My imagination makes it so. Looking for a festive bit of Jamie Fraser? Aren't we all! Zazzle has a great range in festive Fraser Santa hats for Outlander fans. They all incorporate the 18th century tartan, as might have featured on the big man Himself. I say 'might', because most Scottish tartans were created in the 19th century by enterprising merchants in Edinburgh. However, this particular Clan Fraser of Lovat plaid weave isn't one of them. In fact, it can be attested to circa 1745, which is precisely when Jamie was running around the Highlands. Therefore the 'might' is more to do with whatever scene we're looking at. He's not always clad in much at all. But if he is, then this is the right period and the right clan. They are certainly both phrases that would have me rushing to sit on Santa's knee! Though I won't go through the reasons why here, as they are fully explained further on down this page. Don't fuss, it's Christmas and we are ready! That's the over-riding message taken from these Outlander Xmas stockings read together! Such pretty Outlander Christmas stockings to be dangling from your mantelpiece this holiday season! All three related to Jamie and Claire in some way. Again there is the Fraser tartan on festive decorations, but the phrases are relevant too. I could waffle more about this, but my imagination has been waylaid into recalling that scene where Claire found herself in need of stocking repairing skills. Jamie and Ian found it so amusing that she had never been taught how to darn socks. Poor woman! I write, even as I'm giggling along with the Highlanders. Yet she really dinna have to fash, when Jamie was right there with HIS darning needle on the go. Claire would probably have killed in that moment for something as fine as the needlework above and below. Though these are Xmas stockings for Outlander fans, thus not entirely practical to wear during heavy winters. Just to totally reiterate that point, these Clan Fraser Christmas stockings come in a variety of styles, but not as festive attire. They seasonal decorations pure and simple. I don't think you can even put gifts inside them! ... by which I meant dressing your Christmas tree with Outlander skirts. Je Suis Prest - I am ready - alternates with Nollaig Chridheil - Merry Christmas - in the example above. There are many more choices in Christmas tree skirts for Outlander fans. I must have led a very sheltered life, as I didn't even know that these were a thing. Therefore I had to go digging in order to work out exactly what one would do with a holiday Outlander tree skirt. They really are as cool as they appear. Outlander fans decorate the base of their trees with them, wrapping them around the bucket or stand, then draping the skirt artistically upon the carpet. How wonderful that the red and green of Jamie Fraser's clan tartan matches the festive colors traditionally linked with the holidays! Even if you have people around who have no idea what's happening in the Outlander world (pity them! ), the overall effect will look appropriately seasonal. Naturally, once you have established that these boughs belong to an Outlander Christmas tree, then you'll want some ornaments to dangle from the branches. That's where the Outlander ornaments really take off, with many more designs to match a wider range of tastes. Regardless of our surname and genealogy, we're all Clan Fraser at heart. At least where it touches upon the Laird of Broch Turach! 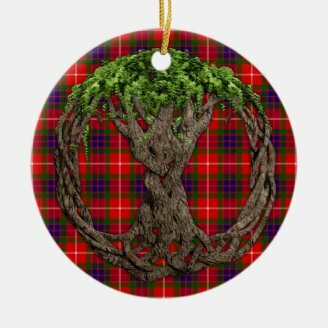 The beauty of looking for Clan Fraser Christmas ornaments is that they're not confined to the Outlander fandom! Clan Fraser exists - currently and historically - in real life. There is a cairn dedicated to them at Culloden. The Clearances carried the Frasers all over the world - including the USA - though not necessarily to Fraser's Ridge, outside the realms of fiction. Of course, there are still Frasers in Scotland too. Those artists and entrepreneurs, crafting Christmas ornaments for Clan Fraser, may be pleasantly surprised by how well their humble offerings sell. They're not even referencing Jamie in their search tags! Set against a background of Fraser tartan, there are some truly beautiful (and meaningful) Christmas gifts for Outlander fans. 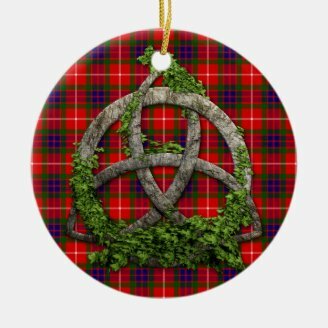 This Clan Fraser tartan ornament is my personal favorite. The Celtic Triquetra here is actually tattooed on my back. It's a symbol which depicts the inter-related nature of the world. Christians will read into it the Holy Trinity of the Father, Son and Holy Ghost. Wiccans will find the Goddess: Maiden, Mother and Crone. Pagans in general interpret the connectivity between Earth, sky and water. Those steeped in Celtic spirituality talk about the interposed worlds separated by a thin veil. This world, the Otherworld and the Afterworld. Considering the supernatural elements in the Outlander tales, this one works best of all in context. There is the 20th century world wherein Claire was born; and the 18th century of Jamie's reality. There too is the stranger world, hinted amidst the stones, glimpsed as a ghostly Highlander on a modern Inverness street, or transporting shoes from a creek to a doorstep on Fraser's Ridge. With a wee bit of imagination, that scene on the second decoration could well be the woodland below Lallybroch or the pines around Fraser's Ridge. The Fraser plaid pattern hints as much. The tree of life is not confined to Celtic spirituality. Cultures all over the world have incorporated it into their legendary reality. But it does hold a particular resonance amidst the Celtic tree code and the ancient druidic groves. It links this world with the Underworld. All inter-connected again. All that's visible has roots unseen. Claire passing through the stones. Ghosts haunting the mountains and towns. Lots of Outlander symbolism there! It's the motto that Jamie Fraser whispers before awkward meetings with the MacKenzie brothers, or yells into his Highland charge at Prestonpans. Je suis prest - I am ready - is the oath given by generations of Clan Fraser of Lovat. Words by which they live or die. But that's merely Jamie as a warrior, and a loyal Highland man. In love he has a more personal promise to make. Words that disarmed Claire Randall. Words that have delighted Outlander fans for decades. In all matters involving Jamie Fraser, 'Outlander' fans will usually cry, 'I Am Ready!' Only that's phrased 'Je Suis Prest' - the motto of Clan Fraser of Lovat. Looking for a romantic Christmas gift for an Outlander fan? Pay attention now! Da mi basia mille harks back to ancient poetry recited by Jamie Fraser to charm his beloved Claire. As fans know, it goes much, much deeper than that. But that would be spoilers for those not already there. It translates as 'I will give you a thousand kisses'. Jamie's promise to Claire that was more than adequately fulfilled, as those amazing chapters unfolded. As an Outlander fan gift for Christmas, it may be considered a triumph. Anyone in receipt of it will be grinning as much as I am writing this; perhaps more, if you follow it up with delivering those kisses too. In many ways, this isn't an entirely fabulous phrase, but it's rendered so because of Jamie. For Outlander fans across the globe, it's become one of the greatest things ever uttered by man. Or, indeed, in this particular case, written by woman to be whispered by Himself. A wonderful addition to anyone's Christmas tree. But mostly mine. Don't fuss, Outlander fans, we have gifts for you. Not only in the physical things, but in an exploration through the meaning of Dinna Fash Yourself, Sassenach. Outlander Christmas ornaments don't arrive much more romantically than this one. It repeats the oath given in Gaelic by Jamie and Claire upon their wedding day. The double sided versions of the Blood of my Blood Christmas ornaments have both the Gaelic and English, depending upon which frontage swings into view upon your bough. If you're here on the hunt for a Christmas decoration as a gift for an Outlander fan, then be careful here. You may be inadvertently implying that you want to wed the recipient. Unless, of course, this really is a veiled marriage proposal. In which case, buy away, then report back so that we can squee over the tale! The Fraser clan aren't the only family in the Highlands, nor yet even the Outlander universe. Amongst the notable rest are Clan MacKenzie of Castle Leoch - Jamie's blood kin and Claire's highly suspicious hosts. Whether it's Colum and Dougal at the beginning of the series, or Roger et al later on, then the MacKenzies have a strong role to play in this epic saga. It would be a shame to miss them out of the festive celebrations. Particularly when the green hues of their tartan look so perfectly seasonal, when placed next to the Fraser red! Add your own photograph to these custom Outlander ornaments! That's one way of claiming your place in the clan! Given the propensity of Jamie, Claire and company to move around, there are a lot of locations in which Outlander fans might rejoice. Nor is it only the characters and cast of Outlander who spread out around the world. Ever since Sam Heughan was first named as the real world face of Jamie Fraser, he gained a new legion of fans. As the actor playing the role in the Starz dramatization of Outlander, he merely co-opted those already charmed to the core by the literary laird. Fans of Jamie Fraser renamed themselves Heughan's Heughligans. They were so confident in Sam Heughan's ability to bring Jamie to life, that these Heughligan Christmas ornaments were being created, while the actor was still filming his scenes in Scotland! Ok, it doesn't look much like an Outlander Christmas ornament, but it's double-sided. The reverse has Fraser tartan and that Heughligan reference. The 'official' nature of the Christmas Heughligan decorations doesn't just refer to the fandom. Herself has also given her blessing to this one! Diana Gabaldon supports the fan-made merchandise because all profits are going to charity. Leukaemia & Lymphoma Research will benefit from each Heughligan ornament sold. Nor is this all about Sam! Caitriona Balfe is the actress honored in these Outlander inspired ornaments for your Christmas tree. She is, of course, the lady bringing Claire Randall to life in Starz's television adaptation. These Outlander ornaments are also here to raise money for charity. All of the creator Caitrionation's profits go to World Child Cancer. They will help fund care for pediatric in developing countries. There's an auld song that keeps on being played across the waters, wherever the Scots found their clans. 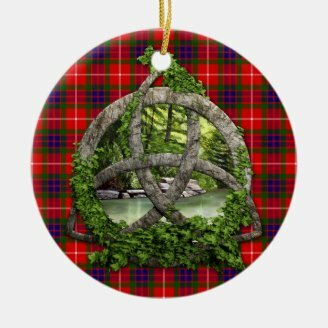 Remember your roots with some Scottish Christmas ornaments. It's Spring 2014, with the television adaptation of Diana Gabaldon's books there on the horizon. Check out the latest Outlander mugs created by fans while they wait! Are you another fan of Outlander? I've just got to a very wonderful part of 'Drums of Autumn' again. I knew it was coming (this isn't the first time I've read this series! ), but it was still as sweet. Thanks for sharing this, very nice article. You might feel differently in 2014! Are you another Outlander fan? I love the idea of keeping 2013. Not just to make a statement, it makes life easier in so many ways!